Definition at line 4639 of file integer.cpp. Definition at line 288 of file modarith.h. Definition at line 290 of file modarith.h. Definition at line 292 of file modarith.h. 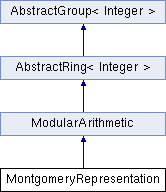 Definition at line 4676 of file integer.cpp. Definition at line 297 of file modarith.h. Definition at line 4650 of file integer.cpp. Definition at line 4663 of file integer.cpp. Definition at line 4689 of file integer.cpp. Definition at line 309 of file modarith.h.